A police estimate put the turn-out at 10,500 in Paris. FRANCE’S “YELLOW VEST” movement demonstrated against alleged police violence in rallies across the country today, as nearly 60 lawyers denounced the treatment of protesters in the courts. Today, a group of 59 lawyers published an open letter on the France Info news website denouncing what they said was the harsh treatment of yellow vest protesters in the courts. The IGPN, the body that investigates police abuses, has launched 116 investigations into the conduct of officers during the protests, 10 of them concerning serious eye injuries suffered by demonstrators. Yesterday’s court ruling against banning the “defensive ball launchers”, known as LBDs, came despite claims by the Desarmons-Les (Disarm Them) collective that the weapons have blinded or seriously injured 20 protesters. 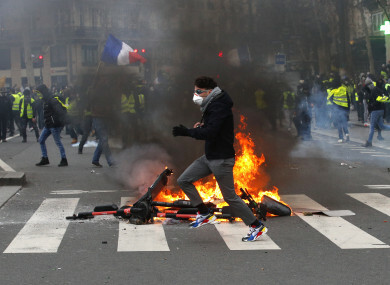 Email “Thousands march in Paris 'yellow vest' protest to rally against alleged police violence”. Feedback on “Thousands march in Paris 'yellow vest' protest to rally against alleged police violence”.